I’m enjoying the cool mountain air today for a little break from reading, writing, and summer activities. I’m also getting ready to attend a summer writing conference this weekend. For the first time I’m turning over ALWAYS in the MIDDLE to another blogger. What a pleasure for me to introduce Justin from JUSTIN TALKS BOOKS and his review of SPY SCHOOL by Stuart Gibbs. Thanks for giving me a break! Hello everyone, my name is Justin Doan, self-blogger at justintalksbooks.blogspot.com. I started blogging when I was just 11 and now I’m 14 and have amassed over 12 thousand views. I write all about middle grade and a little about YA, especially about my favorite author, Stuart Gibbs. Here is my review, on one of my favorite books, Spy School. What I didn’t like: Let me just start out with saying: the cursing. Yes, there are bad words in this novel, but keep in mind this: I talked to the author himself and he said that he only stuck in the various language because it could give some character to the book. He was advised to do so by somebody (an editor I think?) and so he did and he received a million hate comments for it. He’s removed all bad language from the rest of his books (unless you consider “stupid” “dumb” and “idiot” bad words) Another thing I didn’t like was the classic format for all middle grade books. While it varies, in MG if we’re talking about a kid and school it’s always: There’s a loser at blah blah school. Suddenly he catches a break and he talks to his crush. For half the book everything is really awesome with only minor flaws. Then there’s a huge conflict at the end. The ending is either “YAY! We made it!” or “Aw, we lost” I feel like I could explain the plot of this book at a general level using the normal MG format, and while it’s not bad, it’s just overused. Thanks Justin! 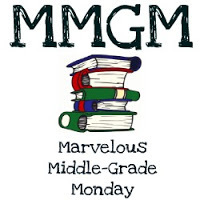 I’ll be back for another round of Marvelous Middle Grade Monday. Have a great weekend. This entry was posted in Reviews and tagged Justin Talks Books, Spy School, Stuart Gibbs. Bookmark the permalink. Nice job, Justin. My son might like this one. Keep blogging, Justin. You’re off to a great start! Great review. Sounds like a good story and I appreciated your frankness!